At Deadline Couriers we are proud to announce the arrival of the biggest member of our fleet, our new temperature controlled, freezer truck for specialised food deliveries. In a continued effort to provide our customers with a large range of specialised transport services we are adding to our vehicle fleet the first of a group of temperature controlled trucks, which is currently being branded and will soon be seen on the Irish roads. 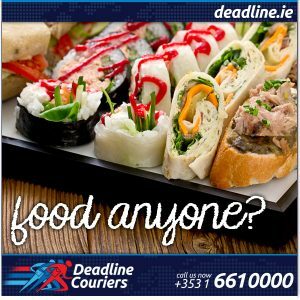 Our intention is expanding our existing service of food and perishable goods delivery that we already operate in Ireland with smaller vehicles and a team of fully trained drivers in the proper handling of food. Currently our food transport vans are fitted with removable flooring to ensure any spillages can be cleaned ensuring cleanliness at all times and are large enough to accommodate 8 – 10 hot lock boxes. Ramps are also fitted to enable easy loading of food trollies. Most importantly, we can agree with our clients the supply of a dedicated vehicle and a dedicated driver, for those regular deliveries that require regular personal knowledge and expertise. Our bigger refrigerated trucks will enable us to handle larger loads making us one of the leading Irish independent providers of specialised food delivery. Just one more service to add to our bike, car and van Courier and Urgent Direct Courier, our next day Ireland and Northern Ireland nationwide parcel delivery and our Worldwide International air fright urgent parcel delivery. Not to mention our other specialist transport areas such as legal deliveries, medical equipment transport, construction deliveries, etc.